I haven't posted here in HOW LONG? I've been getting into glass fusing. 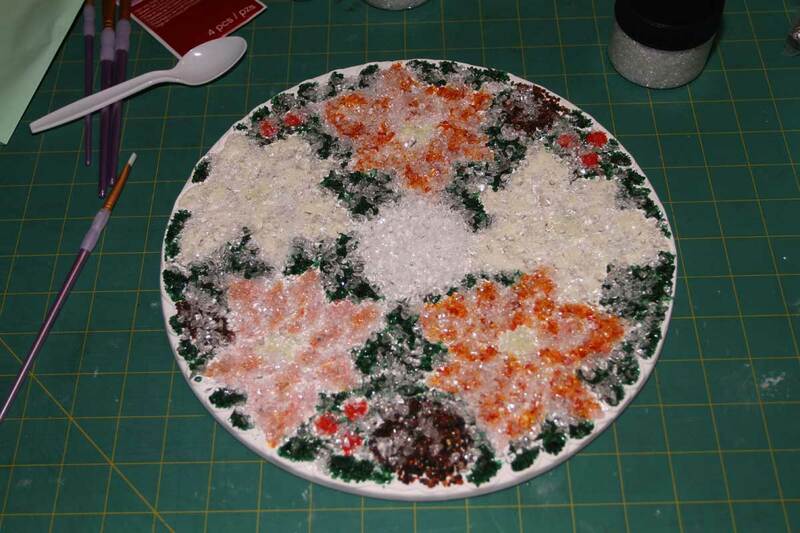 Last year, I made snowflake ornaments with pictures of family members on the points of the flakes. It cam out very nicely. 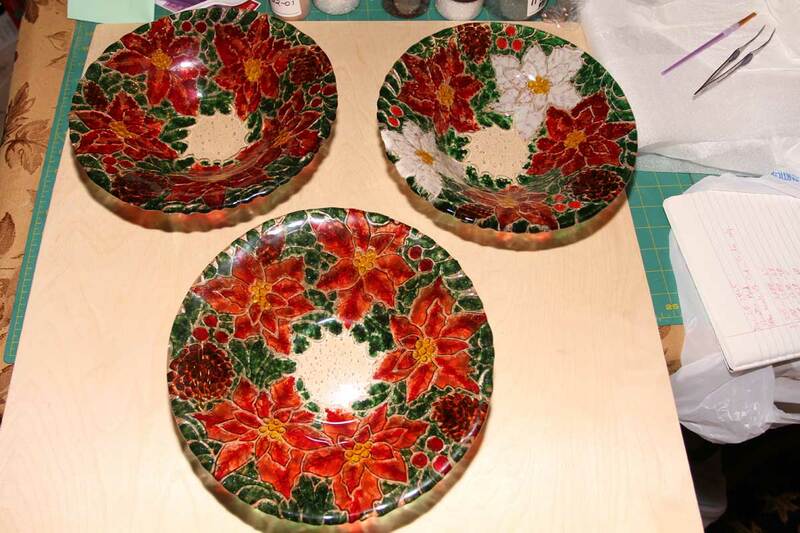 This year, it's poinsettia bowls. 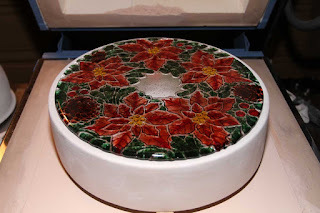 I picked up the Creative Paradise Poinsettia Texture Mold (11.25-inches) and the Bullseye Classic Bowl mold (12.5-inches) off the web along with all the Bullseye frit and Tekta I would need for the project. The problem is, I don't have a teacher and have to suffer accordingly. My initial firings went badly. I made a few critical errors all at once. The photo to the left is one of two platters that had large eruptions. 1) Need more frit: The center of the mold is clear. I didn't put any frit there. So a big bubble formed. 2) On poor footing: I put the kiln furniture "feet" well inside the perimeter of the texture plate. This alters both temperature and convection. The photo at the top of this post shows better placement. 3) Poor fundamentals: I ramped too fast and squeezed in the wrong places. My schedule didn't account a nice long bubble squeeze. With so much frit and so many locations to trap air, you can't hurry this pattern. 4) Need MORE frit: My third firing of the pattern produced a nice plate. No eruptions. My fourth firing (seen above) had three large eruptions. I was being VERY exacting in my placement of frit. Every section got frit and I kept them well separated. Bad idea. The key is to use the scraps from your circular caps to make frit. I got an Anraku frit maker and screens to create and sort frit. I used two 12-inch square 3mm Tekta glass to make the 11-inch disks. This meant plenty of scrap glass left over for frit. I filled the areas of the mold with the colors I wanted (and clear in the center), same as before. Then I followed up with clear frit on all exposed dividing lines between the colored areas. I didn't want the cap glass disks to settle on any area of the mold. Let the bubble squeeze step work its magic without any interference. 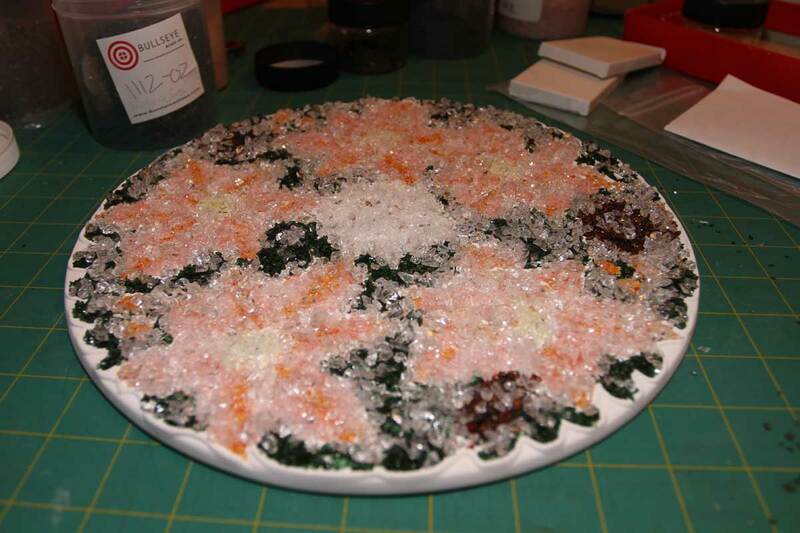 This is an on-edge photo of the design showing just how much frit I'm using. 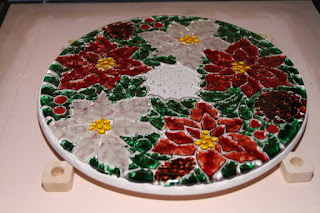 Once I got a good firing, I cleaned the plate and readied it for slumping. 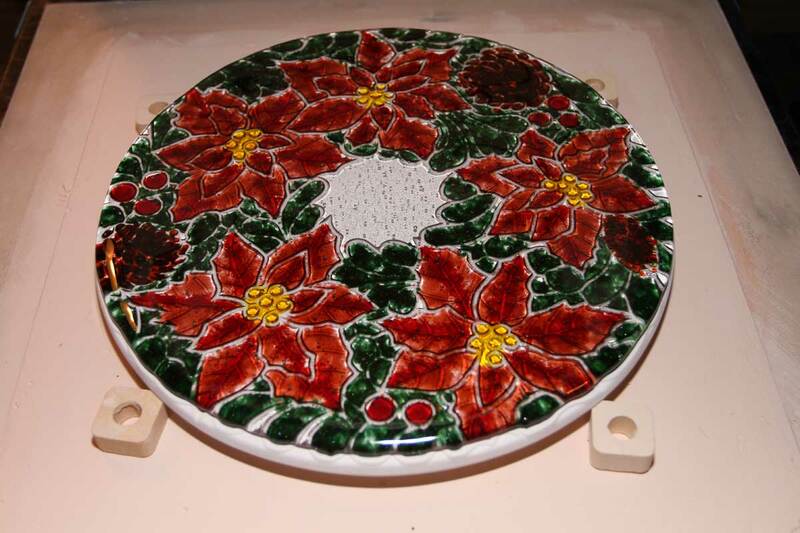 Another plate prepared and ready to fire. I hope to complete 4 more bowls before Christmas. The first three bowls were wrapped in bubble wrap until I couldn't feel the edges, placed in boxes, and the boxes were wrapped in bubble wrap and placed in a larger box for shipping. I hope they all make it to my family in California. 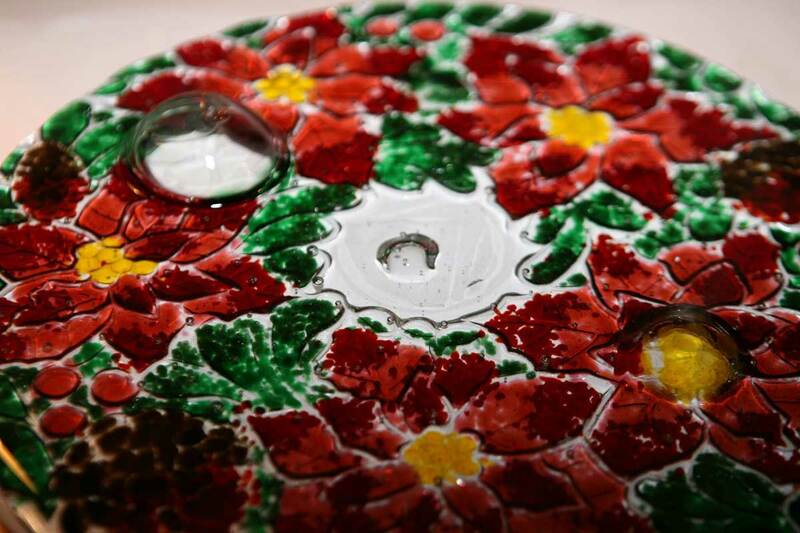 Many thanks to the people of Creative Paradise Glass! I was able to bounce ideas off of them and receive very positive critical feedback on how to solve my eruption issues. They also helped me determine that my kiln may be running 25-30 degrees hotter at the highest temps. 2 100 1200 60 Beginning of bubble squeeze with plenty of time to do it. 4 275 1430 5 I was going to 1450, but my kiln runs a bit hot. Your mileage may vary. 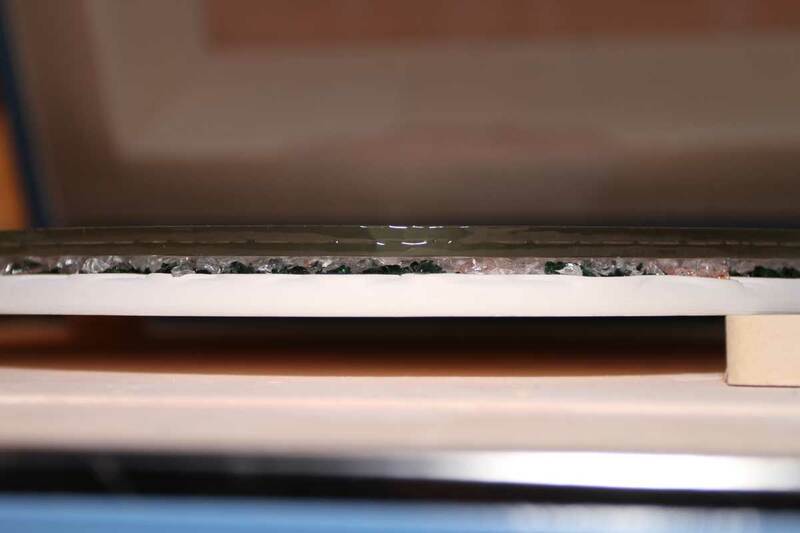 5 FULL 950 60 Annealing the glass. My kiln takes about half an hour to drop to this temp. No need to crash the temp. 6 80 750 10 Nice and slow. 7 300 120 0 We pick up speed here, but I think below 650 my temps are much slower than 300 degrees per hour. 1 150 300 15 Just getting warmed up. 2 200 1100 15 Soak it in. Speed kills, so let's not stress the glass into the slump mold. 3 150 1225 10 It turns out, I'm fairly well slumped at 1225 already. The 10 minute hold is to make sure the "foot" of the bowl is well seated. 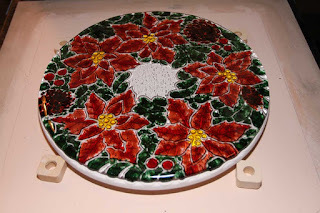 The poinsettia textures are on the outside of the bowl, so I wish to avoid any wobbling of the bowl when it is used. 4 FULL 950 60 Same notes as fusing schedule. I love these bowls. They truly are remarkable. Thank you for sharing.